The traditional Latin Mass – effectively banned by Rome for 40 years – is to be reintroduced into every Roman Catholic parish in England and Wales, the senior Vatican cardinal in charge of Latin liturgy said at a press conference in London today. In addition, all seminaries will be required to teach trainee priests how to say the old Mass so that they can celebrate it in all parishes. Catholic congregations throughout the world will receive special instruction on how to appreciate the old services, formerly known as the Tridentine Rite. Yesterday’s announcement by the senior Vatican cardinal in charge of Latin liturgy, Cardinal Dario Castrillon Hoyos, speaking on behalf of Pope Benedict XVI, will horrify Catholic liberals, including many bishops of England and Wales. The Pope upset the liberals last year when he issued a decree removing their power to block the celebration of the old Mass. Yesterday’s move demonstrates that the Vatican intends to go much further in promoting the ancient liturgy. The Cardinal, who heads the Pontifical Commission Ecclesia Dei, made his comments as he was preparing to celebrate a traditional Latin Mass at Westminster Cathedral yesterday, the first time a cardinal has done so there for 40 years. In the traditional rite, the priest faces in the same direction as the people and reads the main prayer of the Mass in Latin, in a voice so low as to be virtually silent. By contrast, in the new rite the priest faces the people and speaks audibly in the local language. 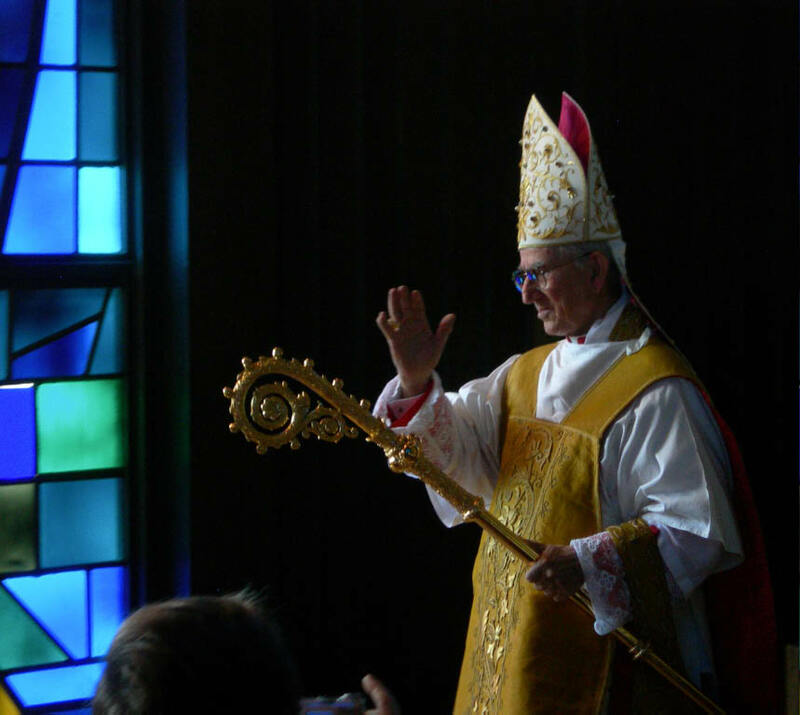 Cardinal Castrillon said that the reverent silence of the traditional rite was one of the “treasures” that Catholics would rediscover, and young worshippers would encounter for the first time. Pope Benedict will reintroduce the old rite – which will be known as the “Gregorian Rite” – even where the congregation has not asked for it. “People don’t know about it, and therefore they don’t ask for it,” the Cardinal explained. However, the new rite will not disappear; the Pope wishes to see the two forms of Mass existing side by side. Such sweeping liturgical changes are certain to cause intense controversy. At a press conference, a journalist from the liberal Tablet magazine, which is close to the English bishops, told the Cardinal that the new liturgical changes amounted to “going backwards”. Following last year’s papal decree, liberal bishops in England and America have attempted to limit the takeup of the old Mass by arguing that the rules say it should only be reintroduced when a “stable group” of the faithful request it. But Cardinal Castrillon said that a stable group could consist of as few as three people, and they need not come from the same parish. The changes will take a few years to implement fully, he added, just as the Second Vatican Council had taken a long time to absorb. He insisted that the widespread reintroduction of the old Mass did not contradict the teachings of the Council. This last Thursday our Lord ascended into heaven. The last words put before us were these: “Go ye into the whole world and preach the Gospel to every creature. He that believeth and is baptized shall be saved: but he that believeth not shall be condemned.” At the end of the Gospel the Paschal Candle was extinguished, symbolizing the presence of Christ no longer among us, or rather now transferred to you. For our Lord came only to cast fire upon this earth, divine fire in your soul, and the flame that we received on the Paschal vigil, lit from the Paschal candle, Christ our Light, will now burst forth at Pentecost, in tongues of fire unto all the ends of the earth. The continuation of Christ’s life among us now depends on you, his Mystical Body. The salvation of the world now depends on you, “for he that believeth not shall be condemned.” We heard at the end of the gospel the Apostles response “But they going forth preached everywhere, the Lord working withal, and confirming the word with signs that followed.” What will be your response? For all are called to bear witness to this divine light they have received, in word and deed to our cold dark culture of death, as our late, and rather optimistic Holy Father referred to it. However, Our Lord calls certain representatives today to participate in this work most intimately, sharing in his very priestly persona. A priesthood, which is in fact, rooted in nothing less than the incarnation itself, the union of the divine and human nature in Christ who is thus the sole mediator between God and man. And because it is a vocation so divine in its end it must also be divine in its means. And so let us listen for the supernatural criteria by which one discerns such a call. The vocation to the priesthood is seen in 3 principle signs St. Alphonsus tells us. First, purity of intention– the intention above all to serve God and save souls for the glory of God, and not to please men, or gain the esteem of others, for the scriptures tell us “God hath scattered the bones of them that please men: they have been confounded, because God hath despised them,” (Ps. 52:6), that is, those who pleased men apart from or contrary to God’s good pleasure, which is indeed the plague of the Church today. Lastly, yet most importantly there is needed goodness of character, both due to the fact that the priest must become the guide of others in the way of holiness, and, most of all, because he stands in the very Holy of Holies and holds the Body of Christ in his very hands, consecrated for this sole purpose. 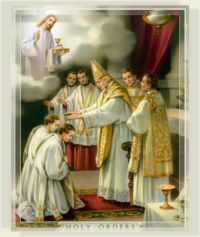 Thus not only his hands but his whole soul must be consecrated and set apart for god, which the Church sums up in a most beautiful phrase in the ordination rite, “Imitamini quod tractatis” Imitate what you handle; that is, Sacrifice yourself as Christ sacrifices himself for the glory of God and salvation of souls. Live the Mass. Now please don’t misunderstand. These are the qualities needed to be ordained. Yet in he who has only begun to discern, these qualities will be present in a true but seminal / undeveloped fashion. For it takes many, many years in the seminary to form a priest. In the one just discerning, these qualities will be seen in the desire to give oneself to God, in the desire to know and teach the faith, in the desire to be holy, even despite one’s past and present failings, which may serve well to humble the soul. Lastly for the young man discerning this call, the Church most highly recommends above all else for The Spiritual Exercises of St. Ignatius, which are most profitably done on retreat, but can even be done amidst one’s daily life if they set aside some time for prayer each day to consider them. They simply focus the mind on what reality truly is; that you have been created for the praise and service of God alone, and by this means to save your soul. Everything else passes away, and only has value with reference to this. St. Ignatius converted his roommate Francis Xavier, by awakening him every morning with this consideration- what would it profit you if you gained the whole world, but lost your own soul. You then consider all of your sins in their true horror as a rebellion against the good God, who has freely created you and sustains you so as to serve Him and to be happy with Him for ever, and how an eternity in hell, will not compare with the dishonor shown to the infinitely good God by sin, in which we prefer created goods to eternal goodness itself. In short, these considerations and those which follow, put everything into perspective, so that you may then make a choice about your vocation in life, according to what is simply most reasonable, for the attainment of your end- the service of God and the salvation of your soul. And thus whatever choice a man makes in this state, it will be a supernatural one, and if it is to have a family it will be for supernatural motives as well, to manifest the fruitful love between Christ and the Church, and not based on attractions to fading beauty, money, power, etc., which will all pass away and may well be the greatest obstacles to growing in sanctity and saving your soul, as they are truly good things. But the good is the enemy of the best, when it is sought as an end and not a means towards it. So let us spend this brief time dedicated to the Ascension, mediating on our calling in life. And to do so with the utmost generosity of spirit, as the salvation of the world indeed depends on our generosity in whatever state we are in. A generosity, which is simply a response to the generosity of God, who freely chooses to save man, and to choose men to participate in his very own divine work. AS the Father sent me (the Son of God!) so I send you, for the salvation of the world, the ONLY end, which matters after this so-called life, which lasts but for the blink of an eye. Christ came down from heaven and died the most shameful death for love of you. What have you done for Christ, what are you doing for Christ, what will you do for Christ. Holy Mary Mother of the Saviour: Pray for us.